doggie. Pick one up for your favorite pet and yourself to match! 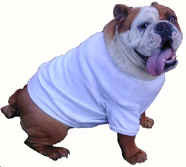 Great item for parades, festivals, or any time you want your dog to be a stand out! Shown just below are how the blank shirts look before tie dying. measurements since the shirts are 100% cotton. Here are some examples of designs available.